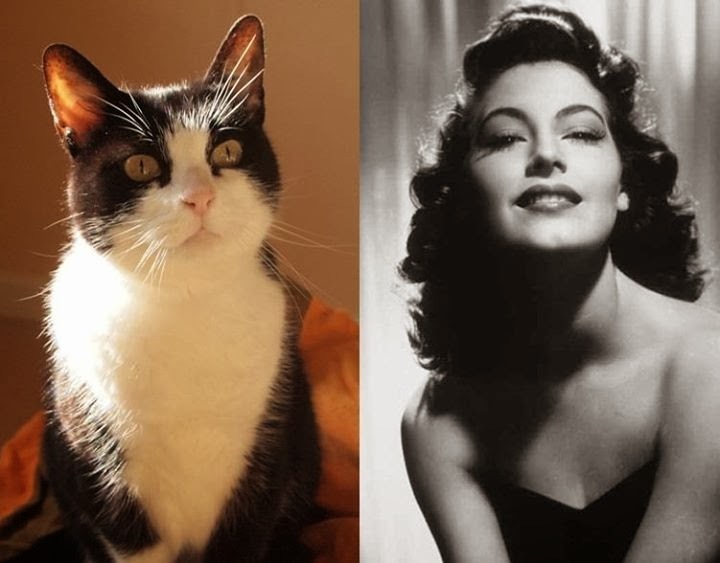 www.leegunnell.com: The Amazing Story of Ava Gardner; the Cat. The Amazing Story of Ava Gardner; the Cat. 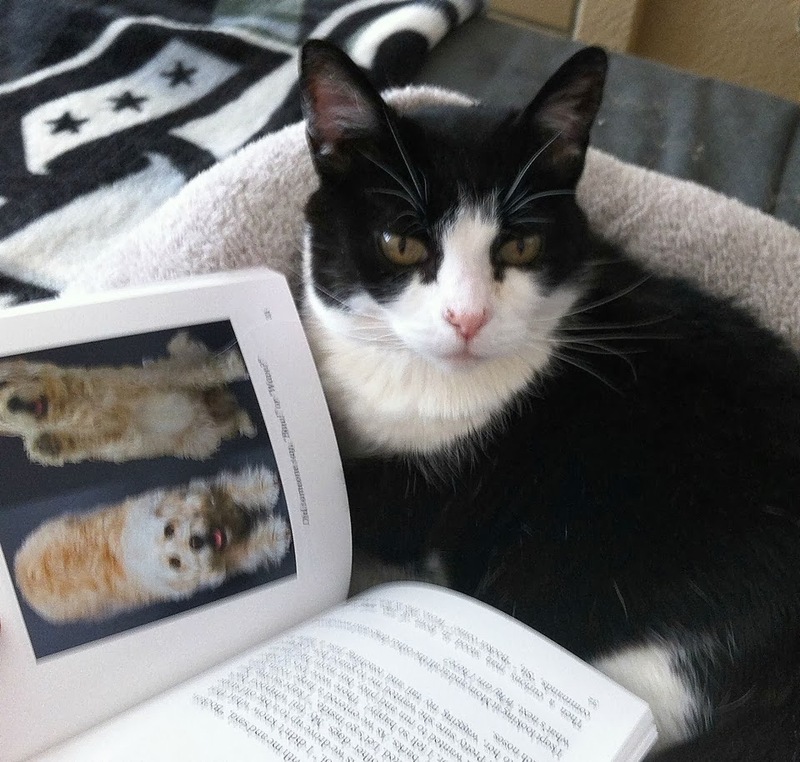 "Ava - Reading the story of Bocker The Labradoodle"
Cats are a polarised species. One side view them as a selfish, hollow, and narcissistic animal; who live to serve the self - at the cost of anyone who crosses their claws. 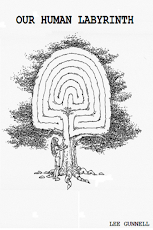 Conversely, there are those who feel the opposite, knowing them as a wonderful creature who - besides enriching the lives of millions on a daily basis, also carry an indescribable source of potent magic; the kind which flows beyond the comprehension, of basic human logic. It all began on a chilly 2011 morning in Martinez, California, where a small tuxedo cat was discovered wandering around a local park opposite the city’s marina; a common occurrence in an area known for its feral colonies. This little cat however, seemed a little different from the general - and understandably distant crowd. 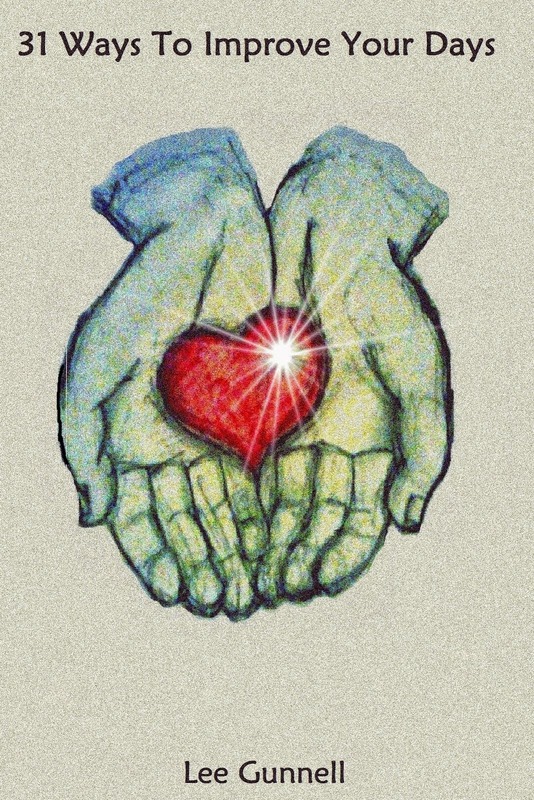 She was friendly, confident, and had no trouble in befriending a homeless couple; whom she chose to care for and feed her during the next fortnight – sleeping safe and sound like a babe in arms, on an old man's pillow. While the homeless couple adored this mysterious moggy, they sensed she deserved a more affluent lifestyle than they could offer. Surrendering her to a local rescue group, where she was determined to be a healthy, spayed 8-year-old; who enjoyed getting what she wanted, being assertive, purring with an alluring loudness, and avoiding other cats of the shelter, she was christened, Quinn. The next step for Quinn was the stressful business of local adoption events; in order to find that deserved Mecca of all cats and dogs – a forever home. And it is here she was to meet a lady by the name of Susie Newton; who was selected by Quinn as her true human - though it would take a while for Susie to fully realise this. Susie was a rescue and re-homing volunteer, and had heard of the mighty Quinn through word of mouth. Upon meeting her – and living with the knowledge her own home already possessed one cat too many, in lieu her landlords wishes, she merely noted Quinn as small, cute, and - perhaps due to her surly personality, impossible to find a home. Months of adoption events, and months of Quinn appearing bored with her surroundings passed, and still the shelter was her purgatory. Much like how great books pass through time unnoticed, was the same anonymous fate for Quinn, going to meet her? As compassionate cat lovers, time was spent by the group, considering reasons why; concluding she merely needed a more ‘sassy’ name, then the slightly dated Quinn. On searching for a suitable handle for this tough yet gorgeous feline - who could hold her own even with the best of them, the answer hit Susie hard, and made perfect sense as she shouted it out loud. Quinn was now... Ava Gardner; it fitted like a Martini from Martinez, in the hand of Frank Sinatra. Yet still nobody took her in. Almost a year had passed, and Ava had grown on no one else but Susie; to the point it was only the worry of an upset landlord, which held her back from taking Ava home. Deciding Ava had had enough of shelter life - and considering how it is easier to ask for forgiveness than permission, Susie finally made her decision, and the adoption papers were signed on Boxing Day, 2011. Susie never gave up on Ava, and Ava never gave up on Susie. 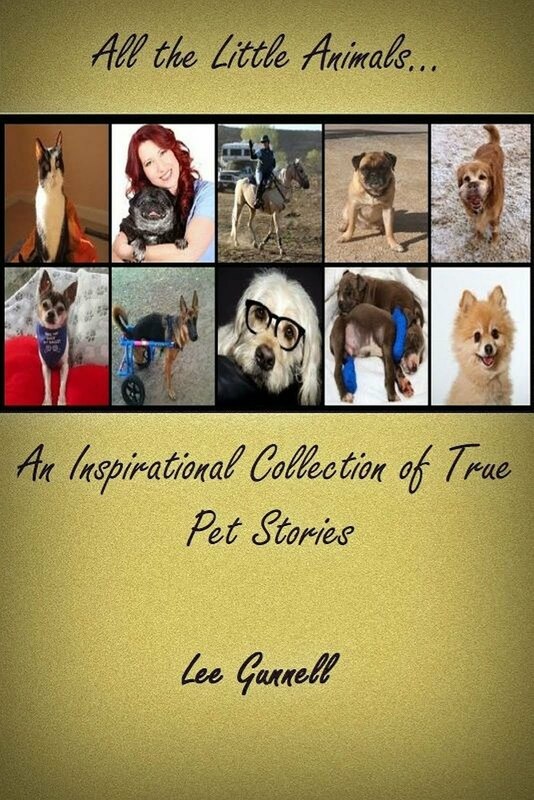 As loving guardians of their animal loved ones do, Susie created a Facebook page; designed as both a portrait of Ava’s glamorous yet unique exploits, and a means to promote issues of responsible domestic pet ownership, neutering, and general help of the natural living world. This is where Ava began to truly shine. Knowing the sheer power of the Internet coupled with numbers, her page grew rapidly from a small collection of friends and well-wishers, to a current total of over 336,000 and growing - which from personal experience, is an extremely rare and difficult number to reach. The little feral cat hanging around in a park adjacent to a marina, is now loved at home, cherished globally, and helping to promote good causes across the world; her journey could have taken one small drastic step the other way, but it didn't - it was never meant to. Ava Gardner the Cat is beautiful, awesome, funny, loveable and kissable just to name a few. I could go on and on about Ava. I am so thankful Susie has shared Ava with all of us, we absolutely love her. I just adore their posts and check to see what is going on daily and nightly. Susie also promotes so many great causes, she really believes in her fight for animals. If you haven't visited Ava's page and you love cats you should, you will not be disappointed. New friends are always welcome so come and visit her soon. Love the story, love Ava, love her funny posts, pictures and her whole family. Terrific story about my pal, Ava..so remarkable. She is a star and role model for those who love and do good for those in need..Love her and mom Susie for all they do for others not so lucky!